San Diego, Calif. (July 18, 2017) — Just one year after becoming one of the first mobile donation apps approved for Apple’s app store, Coin Up has been recognized for charting new territory in technology and philanthropy. 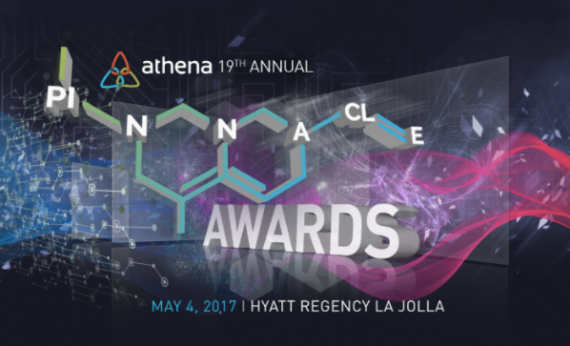 The mobile app’s CEO, Leena Patidar recently accepted the “2017 Start Up Tech of the Year” Pinnacle Award from Athena San Diego, a prestigious women’s organization supporting science, technology, engineering and math (STEM). Patidar is thrilled to be recognized by a group of dynamic women leaders that set the pace of STEM in San Diego. Of course, the 700 members of the audience were encouraged to download the Coin Up mobile donation app (https://www.coinupapp.com/) so they could start steering their virtual pocket change to the numerous nonprofits that have partnered with Coin Up, including Athena of San Diego. Coin Up allows users to channel their virtual spare change to qualified nonprofits, and see the real impact their donations make for a cause they are passionate about. Users of Coin Up can round up their transactions on any credit or debit card and direct the funds to an organization of their choice on the app – making an impact on the go every month. Think of the spare change that has collected in your car over the years, and everyone else’s car and couch cushions. It all adds up. Coin Up’s ability to aggregate each person’s virtual change and bundle it all together is a game-changer as we all move towards a “cashless” society. “Part of what is great about using the Coin Up app is that it continues to spread awareness for all our nonprofit partners. It’s a platform to raise funds but also to share knowledge and passion about the many worthy causes you don’t necessarily hear about every day,” Patidar said. Download the app today or visit the web app to make YOUR change in the world: https://www.coinupapp.com/.